Explore these best, handful of relaxing water park resorts within easy reach from Manila – thereby providing an indeed stress – free, quick and affordable getaway to relieve you of urban busyness, whether you are coming from the Metro, or already residing in Bulacan – also known as the Northern Gateway from Manila. #1 - Cool Waves Ranch and Water Park Resort: Aside from the rice field scenery that surrounds the ranch inspired resort, Coolwaves Ranch and Waterpark Resort is well known because of its thrilling wave pool, and raging river, which is said by as the first installed artificial river in the Philippines. Great escapades, near Manila, good accommodations and amenities but less expensive. Perfect for weekday and weekend getaways. Ideal for families, friends and even for corporate events like teambuilding and others. 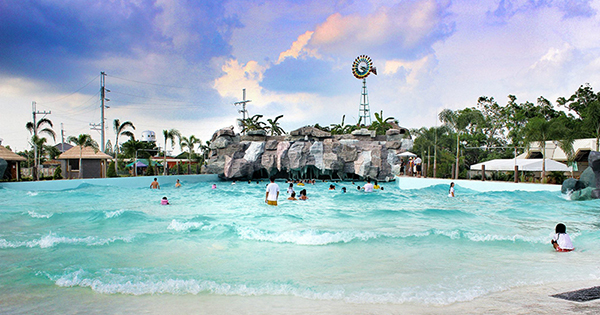 #2 - 8 Waves Water Park & Hotel: You can be sure 8 Waves Water Park & Hotel, in San Rafael, Bulacan, will never let you down. The next thing you know is you could be falling in love with their 2,788 square – meter pool’s huge waves; or their 469 square-meter kiddies pool with Noah’s Ark Slide; not to mention, their lap pool, 3 Hydro – jet Bubble pools, Safari pools with slides; gastronomic satisfaction over at Neptune’s Diner; multi-purpose function hall; a fun volleyball game at their court; billiards, souvenir shop, big bamboo huts, steel cottages or pool umbrellas, for your unforgettable, laid back moments with loved ones, etc. #3 – Klir Water Park Resort: Located in Kabilang Bakood, Guiguinto Bulacan – a mere 30 – minute drive from Manila, discover their exciting and most recent wave pool technology – offering 4 different kinds of swimming pools – one of which is dubbed the biggest wave pool in Luzon – with a size of 3,500 square meters! What is more, available too, are kiddies and adult pools, various affordable cottages to choose from, a restaurant for all your dining needs, event packages, and more. #4 – Galilee Wonderland Waterpark and Hotel: Situated in San Pedro, Bustos, Bulacan, you can never go wrong with their accommodation facilities and outstanding amenities. They have 10 wave pools; a fitness gym, spa, basketball court, billiards and table tennis; plus a Noah’s Ark replica, to experience viewing life-size natural animals! Moreover, they offer lots of lodging options and event hosting for team building, seminars, and more. And the food and drinks are great at the newly built Galilee Cafe which sits right at the very front of the resort's property. #5 – La Florentina Resort: Conceived from the heart of the people who saw the need for a family-oriented yet environment- accented venue where people from all walks of life can enjoy the serenity and beauty of nature while having a heartfelt conversation with their love ones. There are 100 nipa cottages, 12 relaxing villas to stay at, an Olympic size adult pool, a kiddie pool, colourful playground pool and a playground. In addition, the resort has a food hub to feast to your heart’s desire from pasta to tasty local dishes and selections of beverages.